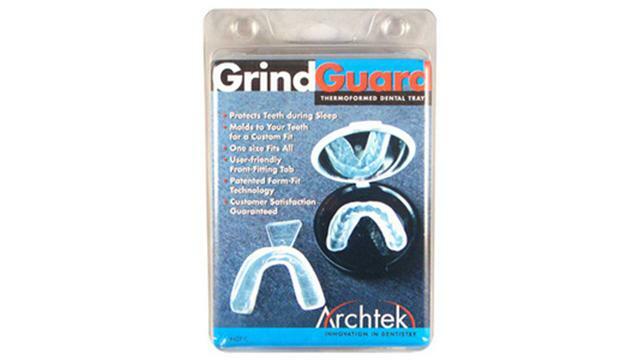 The Archtek Grind Guard™ has been clinically proven to be as effective as a lab produced acrylic splint for the relief of symptoms associated with the night time grinding of teeth and jaw clenching. The easy to fit comfort guard molds to your teeth by simply boiling the mouth piece in hot water and biting down on it. Nothing could be simpler than that, and you won’t have to take exams or go through painful fittings with your dentist. Warranty provided by Archtek Dental. The dentist has never been one of my fviroate places either, but for me, a necessary evil. I grind my teeth too, but I do a great deal in my sleep, and in my thirty's my molars just one by one began falling out of my mouth, or cracking in half for no reason. I was born with teeth that don't get cavities, but I never figured on the severe grinding problem. I was told that as fast as I grind down the soft night guards, (about 6 mo) I need to wear a hard one - which is more expensive. but it has been almost a year and it hasn't broken yet, so I'm not complaining!How many artists/ writers I have met with the same teeth problems! NOW tell me this isn't a stressful career choice!!! I read the instructions several times before forming the guard to my teeth. It was too soft and too flimsy when I placed it in my mouth and when I sucked the air out it turned and I was not aware of it. I tried to correct the shape it formed but I was unable. I did nothing wrong. I followed the instructions to a T and yet I had a problem. However, for the price and the suitability of the product I would purchase another and be even more careful when forming it next time. Updated review: I will shortly be purchasing my third one of these guards. It is still cheaper than paying hundreds at the dentist and having the custom guard only last a couple of months longer than these. I have also been shopping around for other DIY guards, and this one is the best deal that I have found. Your experience, of course, may vary -- if you don't like this style or the material, perhaps. Sometimes it takes more tries to get the fit right. But in my opinion, it's still a good deal, and it beats grinding.